The Paddy Power Games website is filled to the rafters with all sorts of pub style Fruit Machines and online slot games. Joining the fun is very simple and once you're sign up as a player you can enjoy all the fruit and slot machines, casino games and even sports betting from your account. And of course, if you are a new customer then you get the welcome bonus! For those of you on the hunt for big jackpots look no further. Paddy Power Games features two very different mega jackpot sections. The Daily Jackpot must be won every day by a certain time and the Cash Booster must be won before it reaches a certain limit. There is also the incredibly popular Jackpot King with three jackpots up for grabs. The two smaller jackpots must be won before reaching a certain limit and the King just keeps growing until it's won. At time of writing this was up to over £3.9m! Along with the ever expanding range of new games Paddy Power also features classic themed fruit machines like Starburst, Gonzos Quest and Rainbow Riches. Plus there's an entire section dedicated to TV Games so if you love Wheel of Fortune, Family Guy or even a movie themed fruit machine like TED then have a go yourself! Get a great new player welcome bonus with your first deposit at Paddy Power to start playing with today. Whether you like to play on desktop PC, Tablet or Mobile you can get the most from Paddy Power as all devices are supported. If huge jackpots are your aim then Paddy Power delivers as there are some cracking progressive jackpot slots available. A range of great deals every week so if its the latest promo you're after Paddy Power Games is the right choice. The size of jackpots on offer at Paddy Power is massive, from a few hundred quid to over £3 million! Many machines have a progressive jackpot element, this is when a feature jackpot keeps rising until some lucky punter wins it. It's not just the fruit machines with have the big jackpots either, the scratch card games also tasty payouts. There are over 150 fruit machine games on the Paddy Power Games website and every one of them will tell you how many times it's been played today so that you know instantly which is the most popular. You can also play every single one of them in Fun Mode so it won't cost you a pennt to try them out and find your favourite. 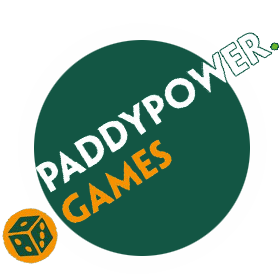 Paddy Power is one of the most respected gaming/betting brands in the UK and Ireland. It has gained a reputation for being honest, trustworthy and 100% safe. New customers to Paddy Power can take advantage of some very special offers, Including Bonus cash, Loyalty Points and monthly promotions.